Throughout history, people have used goards for making everything from bowls to birdhouses. If you are planning on planting some of these decorative plants or you just like to create with items found in nature, you'll find that gourds are versatile craft items. The shell of the gourd may be any number of bright colors and color combinations, making it naturally decorative as well. No matter what type of crafting you like to do, there is a project for you to enjoy. 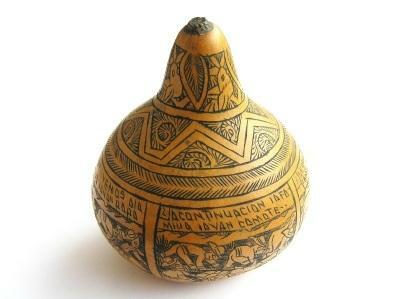 Here are some of the most unique crafts using gourds on the Internet. Woodburning, or pyroengraving as it is often called, can allow you to create beautiful patterns on any object that can be burned. This gourd clock is embellished with a leaf design as well as roman numerals. Once it is polished and finished, the clock is just beautiful. This is not a project for a child, nor is it a project for someone who is inexperienced. Attracting birds to your yard can be as easy as providing them with habitat. Making gourd birdhouses is a fun family project. This gourd birdhouse project from Lowe's is painted with afloral design and would make great décor for inside if you didn't want to use it as a birdhouse. This birdhouse from DIY Network takes you step by step through the process, from choosing a gourd to cleaning it and turning it into a birdhouse. If you are starting with a homegrown gourd and you don't have much experience working with gourds, this may be the best project for you. You can paint, pyroengrave, or decorate a gourd lamp in any number of ways. These instructions are straight-forward and simple to follow. Use a purchased lamp kit, or do as the author did and use parts from a broken lamp to create your lamp. You can actually make handmade paper from gourds and use it to create ornaments for Christmas and other holidays. You can also make specialized hang tags and as many other paper products as your imagination can come up with. If you are looking for a reasonably easy craft, this gourd wreath may be perfect. You can decorate a grapevine wreath with mini gourds to create welcoming autumn décor. Make a Christmas tree decoration by painting a smaller gourd and adding a hanger to it. You can use glitter or other embellishments as well. Make a vase using a bottle-shaped gourd. Make bowls, pencil holders, and other containers. Create rattles and other musical instruments gourds, and then paint them. You can bead a bottle gourd to make a beautiful decoration. No matter whether you buy them or grow your own, finding free gourd craft projects can become a creative obsession. Indulge in it often and feed your inner crafter.